If you'd like to purchase any of the Rogue Kettlebells weighing more than 68kg, please fill out the quote form below. Colors: We color coded the handles. By associating each kettlebell weight increment with a different color handle, it becomes much easier for gym owners and trainers to direct athletes to specific kettlebells on sight alone. 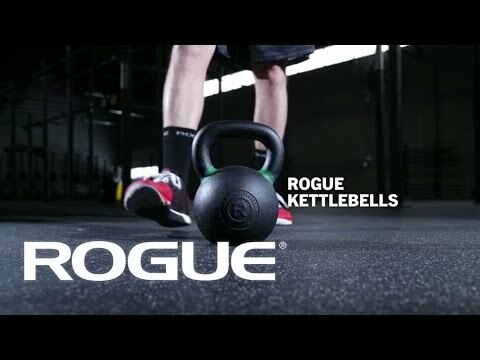 The 97lb (44kg) Rogue Kettlebell is all black without a colored handle. Rogue Kettlebells is rated 4.9 out of 5 by 255. Rated 5 out of 5 by Clay29 from Premium Quality Rogue will not let you down especially with their kettlebells. Great quality, balance and economical. Rated 5 out of 5 by 2Bit CrossFit from Awesome Kettlebells! Luv my Rogue Kettlebell(s). Rugged, well balanced, textured, wide grip stays secure even with sweaty hands. Highly recommend these Bells!